The pioneering work of Linda Tellington-Jones, PhD (Hon) has its roots in a philosophy that sees all beings -- humans and animals alike -- as reflections of a Divine Whole. The Tellington Method was first created 4 decades ago as a system of animal training, healing and communication that allows people to relate to animals in a deeper, more compassionate way -- a way that furthers inter-species connection and honors the body, mind and spirit of both animals and their people. The Tellington Method utilizes a variety of techniques of touch, movement and body language to affect behavior, performance, and health, and to increase an animal’s willingness and ability to learn in a painless and anxiety-free environment. Linda’s highly effective and revolutionary approach to working with animals brought her worldwide recognition, and it was out of this success that Tellington TTouch for humans has arisen, emerging as an important addition to the increasingly respected world of alternative healing practices. The method for horses, first developed in the 1970’s, is known as TTEAM (Tellington TTouch Equine Awareness Method). In the 1980’s, Tellington TTouch broadened to include the world of companion animals, developing techniques that deepen mutual trust and understanding and strengthen the human/animal bond. During this period, TTouch work was also introduced as an effective and valuable method to reduce stress in wild life rehabilitation and to enhance the well-being of animals in zoos. As an internationally acclaimed authority on animal behavior, training and healing, Linda has given presentations and demonstrations on her TTEAM method at veterinary conferences, universities, equestrian expositions, North American Handicapped Riding Association and the Delta Society world conferences, therapeutic riding associations, Olympic training centers, wildlife rehabilitation conferences, and zoos throughout the world. Linda has also brought TTouch into the world of humans, teaching weekend and week-long workshops over the past 15 years in programs for individuals and their family members, as well as for health-care professionals. She is a visiting faculty member at the University of Minnesota where she has co-taught Tellington TTouch for humans annually since 2002. Tellington TTouch is included in the research program at the University of Minnesota’s Center for Spirituality and Healing. The results of studies on humans by Cecilia Wendler, PhD, RN, and CCRN have been published in 3 prestigious professional nursing journals and the Journal of Applied Animal Welfare Science. Through her non-profit organization, Animal Ambassadors International®, she supports projects of children working with animals to enhance understanding, compassion and quality of life for both humans and animals. On June 21, 2008 Linda Tellington-Jones received an Honorary Doctorate degree from the Wisdom University and was granted the position of Director of the Institute for Interspecies Connection. This unique university, licensed by the State of California, is accredited by the World Association of Universities and Colleges and the Accreditation Commission International (ACI). The university, a global learning community, is committed to the pursuit of wisdom as a way of life. Linda Tellington-Jones, the founder of Tellington TTouch Training, has influenced hundreds of thousands of people and animals around the world with her extraordinary teachings. TTouch is a gentle hands-on technique that accelerates learning and enhances behavior, performance, and the well-being of all species, as well as deepening the bond between humans and animals. The work honors the body, mind and spirit of animals and their people. Dr. Garrison is also founder and president of the Gorbachev Foundation/USA, which set the stage for the establishment in 1995 of the State of the World Forum, a San Francisco based non-profit institution created to establish a global network of leaders dedicated to creating a more sustainable global civilization. 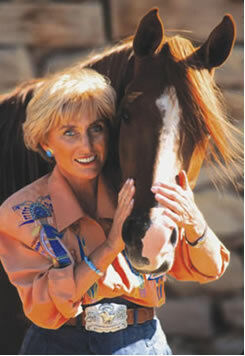 Linda Tellington-Jones has been honored with numerous awards throughout the years, including the Western States Hall of Fame, American Riding Instructors Association Lifetime Achievement Award, Horsewoman of the Year Award, the American Riding Instructors Association Master Instructor Award, the Ronald Reagan Good Citizen Award and most recently, the Massage Therapy Hall of Fame. She is also a graduate of the Feldenkrais Professional Training at the Humanistic Psychology Institute, California. Her latest book is in the field of human health: "TTouch for Healthcare.” In addition to writing 16 books about her work published in 12 languages, she has developed TTouch curriculum for the University of Minnesota’s Center for Spirituality and Healing. Linda has spent decades teaching people how to be effective with TTouch; today there are more than 1,000 certified practitioners teaching TTouch in 27 countries. The Massage Therapy Hall of Fame recognizes Linda's contribution to the art and science of Massage Therapy. Linda Tellington-Jones' work has its roots in a philosophy that sees all beings - humans and animals alike - as reflections of a Divine Whole. The Tellington Method was first created four decades ago as a system of animal training, healing and communication that allows people to relate to animals in a deeper, more compassionate way - a way that furthers inter-species connection and honors the body, mind and spirit of both animals and their people. The Tellington Method utilizes a variety of techniques of touch, movement and body language to affect behavior, performance, and health, and to increase an animal's willingness and ability to learn in a painless and anxiety-free environment. Linda's highly effective and revolutionary approach to working with animals brought her world wide recognition, and it was out of this success that Tellington TTouch for humans has arisen, emerging as an important addition to the increasingly respected world of alternative healing practices. This year an exemplary horsewoman was nominated, and she got "the nod” unanimously from the selection committee. The nomination form that heralded Linda Tellington-Jones’s accomplishments and contributions listed her numerous presentations, lectures, awards, television appearances, videos, books and an explanation of her work that has helped horses and horse people around the world for decades. An innovator in the horse world since the 1960s, Linda’s background includes an amazing variety of riding accomplishments, from hunters, jumpers, dressage, steeplechasing, combined training, competitive trail riding, English pleasure, Western pleasure, Top Ten placings in the world-renowned Tevis Cup 100 mile ride, to a world record in endurance she set in 1964 on a 100-mile race that remained unchallenged for seven years. Her unique background with horses includes directing the Pacific Coast School of Horsemanship in California, a 9-month residential school for riding instructors and trainers attended by international students. Linda’s contributions to equine behavior, health and communication are recognized and acclaimed internationally; her TTouch and TTEAM methods have been successfully used by Olympic contestants and trail riders alike. 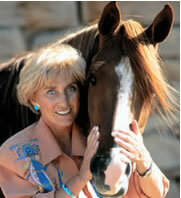 As part of Linda’s legacy, she has authored 15 books in 14 languages and has produced 21 videos of her work with animals. To help spread her work around the world, there are Tellington Method certified practitioners in 26 countries. Her current projects include teaching orphaned children in Africa how to help animals in local veterinary hospitals and animal shelters by using the Tellington Method of TTouch. Publications: Linda has written fifteen books about TTouch and TTEAM which have been printed in twelve languages. Her most recent efforts include THE ULTIMATE HORSE BEHAVIOR AND TRAINING BOOK - Enlightened and Revolutionary Solutions for the 21st Century. Linda Tellington-Jones with Bobbie Lieberman Foreword by John Lyons Introduction by Susan Harding, Publisher of EQUUS and TTOUCH FOR CAREGIVERS, her new book exclusively for humans. Videos: Eighteen videos relating to horses, dogs, cats, and llamas have also been released. TTouch Practitioners: There are more than 1300 practitioners of the Tellington Method in twenty-six countries, as well as Tellington Method Centers in Canada, Germany, Austria, Switzerland, South Africa, the U.K. and U.S.A.. Promotion: Linda and her work have been featured many times over the past eighteen years in prime time television in North American, Europe, United Kingdom and Australia and featured in innumerable publications. In North America these include, including Equus; Practical Horseman; Modern Horse Breeding; Horseman; Good Dog; Trail Blazer; Arabian Horse World; Massage Therapy Journal; New Age Journal; Woman's Day; ASPCA Report; American Way; American Kennel Club Gazette; Horse Illustrated; United Airlines Magazine. Major newspapers and magazines and well as horse, dog and cat publications in Europe, United Kingdom, South Africa, Australia, Canada, Hungary, and France have covered the Tellington Method over the past 35 years. Awards: Awards include the 1994 Horsewoman of the Year Award from the North American Horsemen's Association, the 1992 Lifetime Achievement Award from the American Riding Instructors Association and the 1969 Award for Creative Citizenship from the State of California. Vision and Outreach: Linda’s passion is for spreading her message of understanding and compassion for animals and their people through her books, videos and certified TTouch teachers in 26 countries. · An Introduction to the Tellington-Jones Equine Awareness Method, 1985, a bestselling horse book in Germany and North America; over 100,000 sold. · The Tellington Touch: A Breakthrough Technique in Training and Caring for Your Favorite Animal, 1993, published in USA, Germany and England. · Getting in TTouch: Understand and Influence Your Horse's Behavior, released in April, l995. A best seller Trafalgar Square Press. · Let's Ride! with Linda Tellington-Jones. Published in English in 1997, Trafalgar Square Press. · Improve Your Horse's Well-being: A Step-by-step Guide to TTouch and TTEAM Training, released in 1999. · Fifteen training videos for horses; one for llamas and two each for cats and dogs. The latest is a 1999 video designed to build confidence with riding (in German).